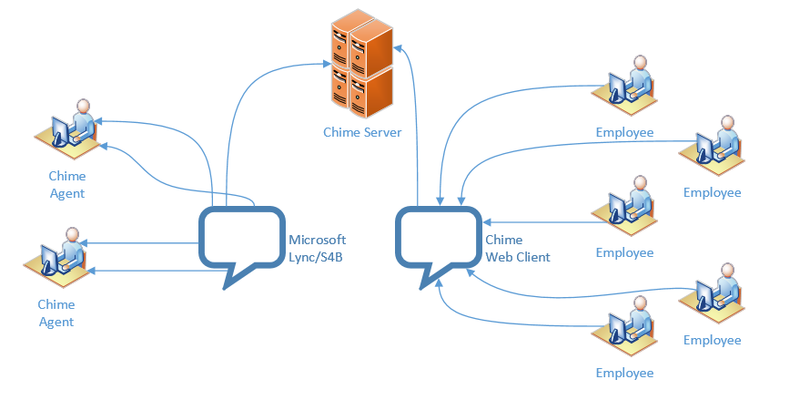 See how Chime for Microsoft Lync/S4B has helped the enterprise service desk. A global IT company operates an internal service desk providing support for internal end users located in North America, Europe, Australia and New Zealand. The service desk provides support for a variety of environments including Windows, Lotus Notes, VPN, etc. 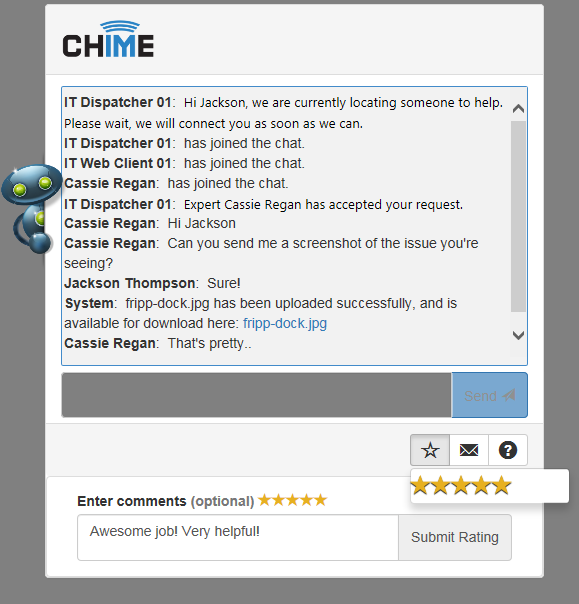 "The end users are extremely satisfied with the implementation of chat. Since they are not tied to a phone they can continue to work while they are waiting for the agent to answer their request, and investigate their issue." 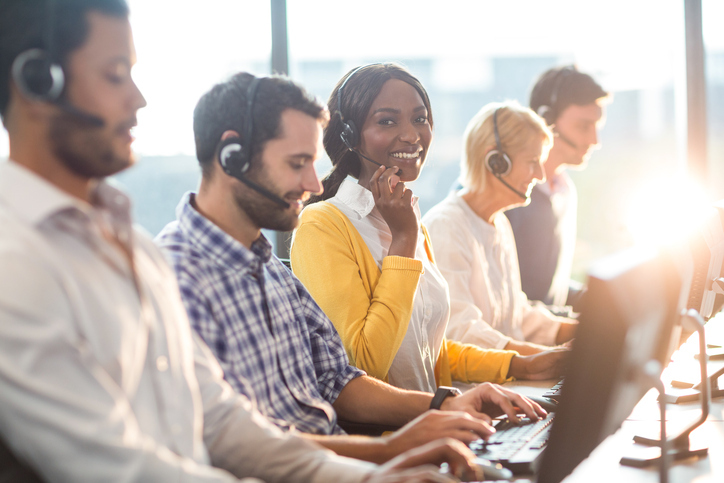 The internal service desk wanted to provide the end user another avenue for support opposed to calling the service desk or opening a support ticket. 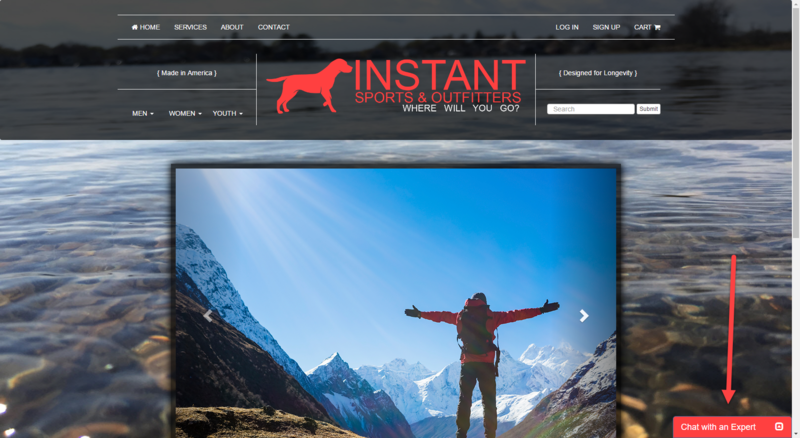 Even issues such as garnering a password reset, inability to access email, or software installation issues, are simple to fix but still required calling the service desk and waiting for an agent. 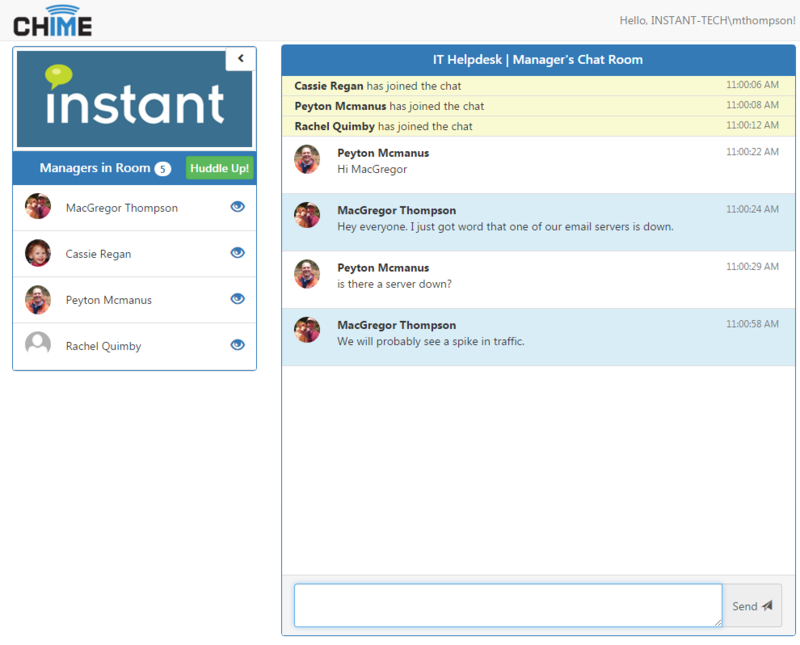 Click-to-chat was a brand new solution for the service desk and it was critical for the following business issues to be fulfilled. 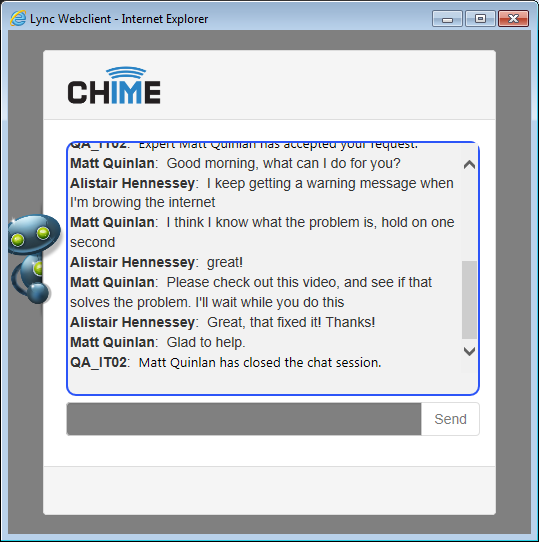 Instant Chime for Lync/S4B has enabled the service desk agents to work on more than one issue at a time. This is a huge advantage over phone support, where the agent can only work with one user at a time. With queues in several languages, including English, Spanish, French, German, Mandarin, Korean, and Russian, employees from offices around the world can get the help they need in the language they speak. As a global enterprise, the company has end users that speak a variety of languages, and accents are always a concern via phone support. 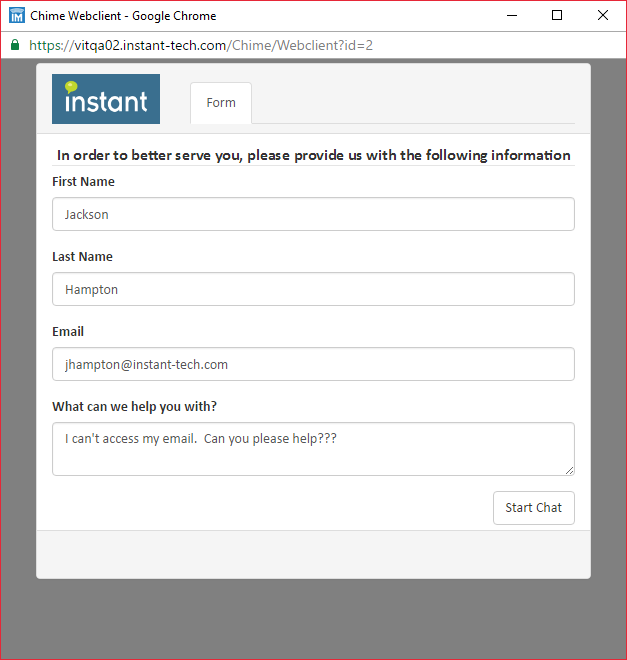 Chat support helps to neutralize the accent barrier between the end user and the service desk agent and also leads to higher customer satisfaction. 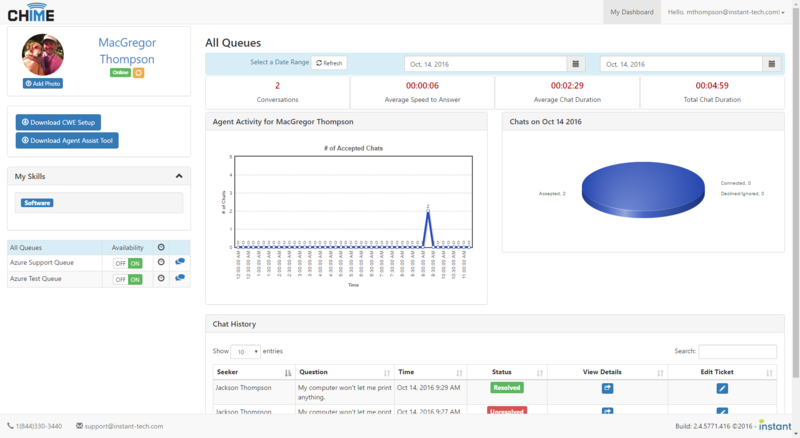 Since both the end user and service desk agent are utilizing the Skype for Business client, they are able to use a majority of rich client features, including the screen capture feature. The end user can send screenshots of their environment which helps the agent quickly identify the issue. In addition, the agents can send the end users a series of steps that they need to perform, or a link to an existing procedure. Security is a high priority and major concern for most companies. Exposing anything to the DMZ without precautions is a major security risk. By having Chime live inside the company firewall, the company prevents any unwanted access to their environment. 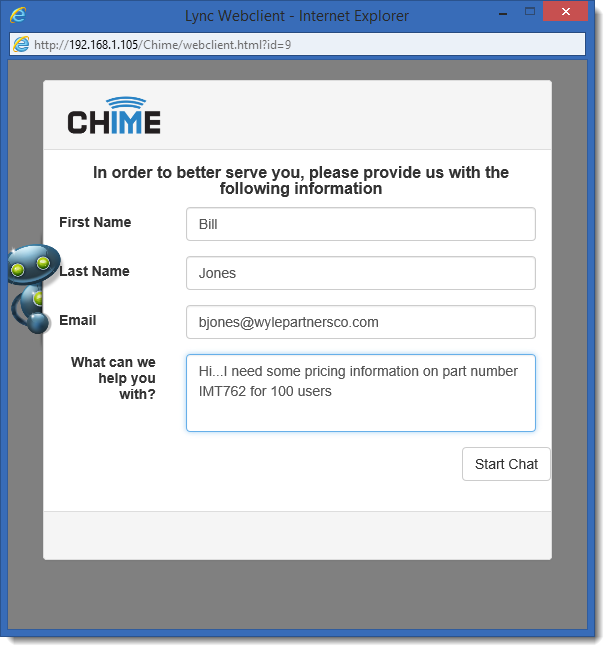 After a customer clicks a button on a web page, Chime will launch a new window that will connect that customer with an agent. 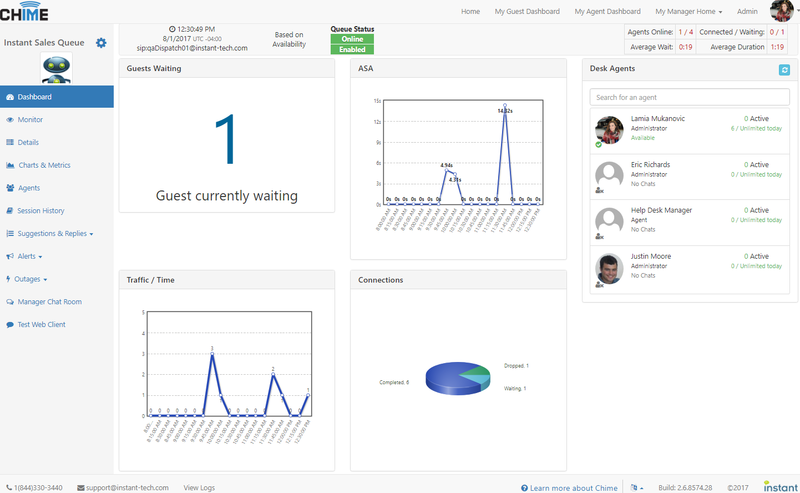 A live chat session between the customer and the agent using Lync/S4B will begin, enabling the seeker to get immediate help. Agents can quickly and easily accept an inbound chat just by clicking on a toast notification. When connected, the agent will see a host of information about the inbound seeker. The agent also has access to any canned/standard replies that have been created. Agents can send and receive files. 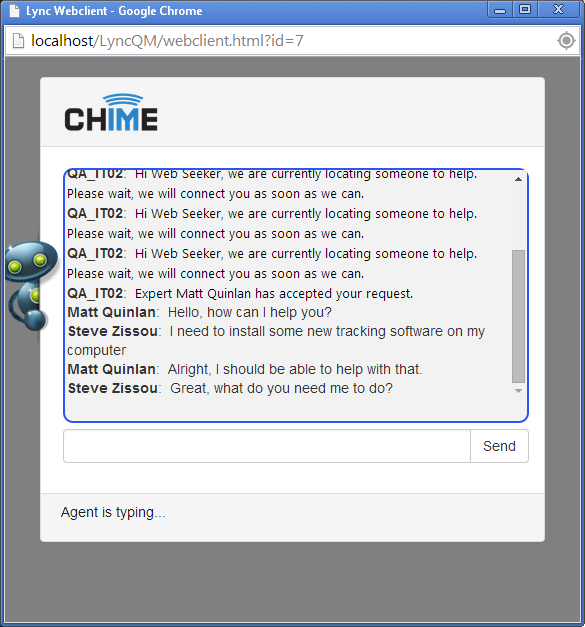 Chime is designed to give agents the ability to give help quickly and efficiently. Because Chime has the concept of roles/permissions, those designated as managers and admins have a host of elevated abilities. These abilities include monitoring ongoing chats, looking at charts and statistics, generating reports, and much more. 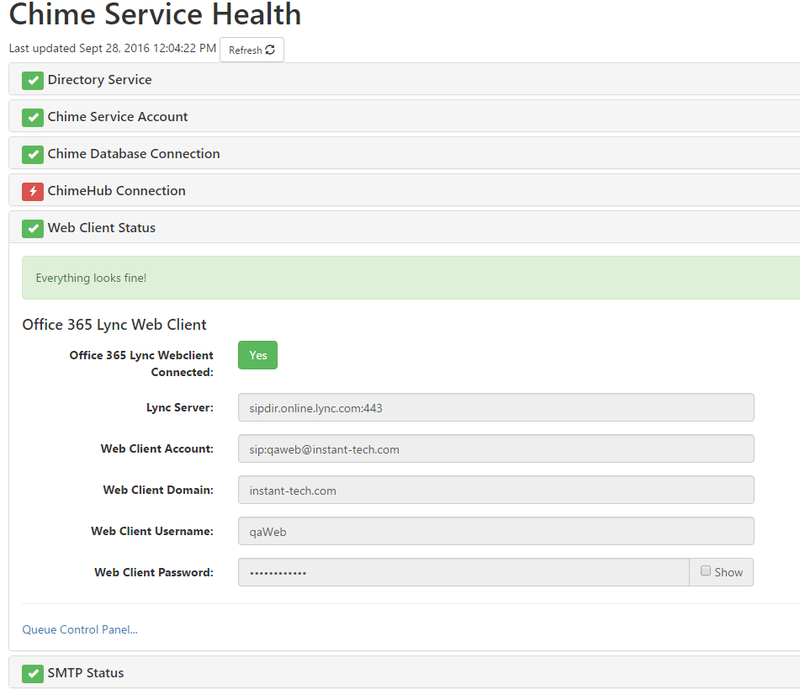 Chime allows the ability to send out Lync/S4B alerts to designated people or groups in an organization. This is really great for those who want to quickly let everyone in your organization know something without being capped at the built-in 250 maximum of Lync/S4B or relying on email. Have a server down? 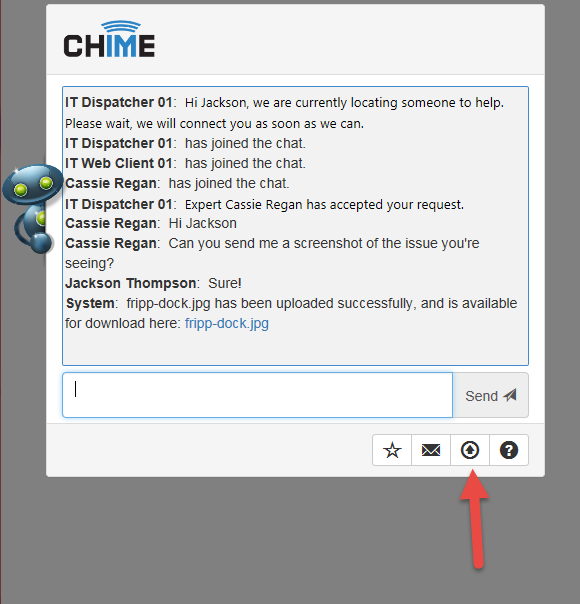 With Chime, you can quickly create an outage that will be displayed to every inbound seeker who starts a chat. This will help deflect any inbound traffic that might be related. An alert can also create an outage, allowing you to preemptively notify people of the outage right through Lync/S4B. 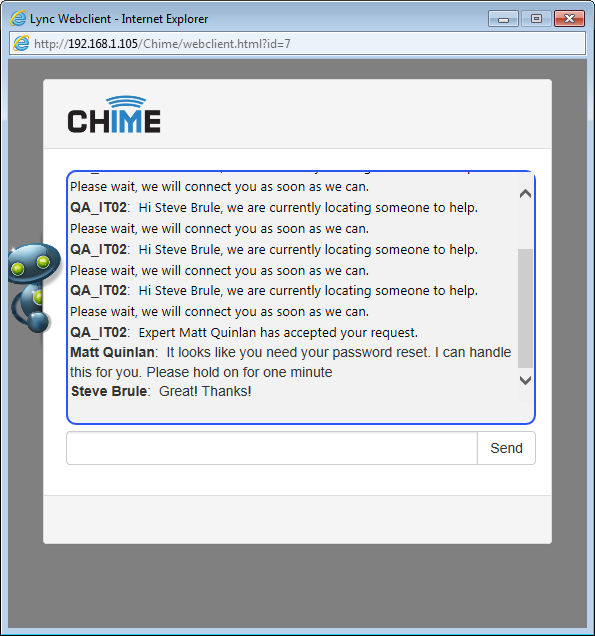 Designed for the enterprise, Chime has the ability to integrate with several platforms via 'virtual agents.' These platforms include SMTP (email), Salesforce, Microsoft Dynamics, ServiceNow, and Alchemy. 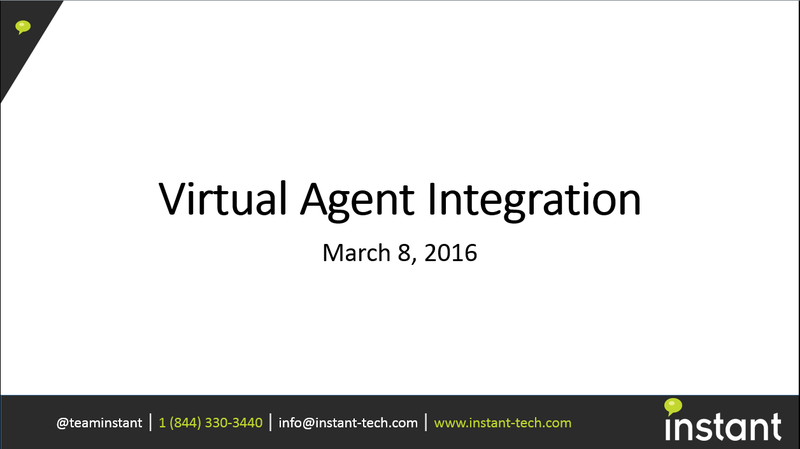 For more info about how to use virtual agents, click here » Virtual Agent Integration.